When they told me last season that I would be ziplining over a crocodile pit I thought they were joking or crazy. Mostly crazy. 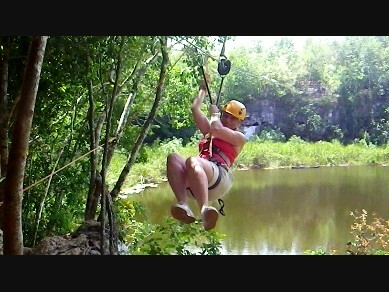 I love ziplining, don’t get me wrong, but this trip was more harrowing than the average eco-adventure. After we hiked through the jungle and learned local lore, I had to zipline over a crocodile filled pit in middle of the Mexican jungle! The video below starts off where we tour a special Mayan community in middle of the Yucatan jungle known as Pacchen where we met a guide who took us on a tour through the jungle and led us to the zipline. We learned about Mayan history before we ziplined over the dangerous crocs. I am convinced this is because they wanted to feed us to the crocs afterwards – no one will believe me. It was an eco-adventure that left a lasting impression on me about what defines “lunch” for a croc. I learned that a jungle is not just home to wild native animals, it is a home where humans and animals co-exist. A great lesson for this terrified-of-crocs lady.